In Boulder’s precinct 808, gubernatorial candidate Cary Kennedy picked up the most delegates, but in a non-binding straw poll, State Attorney General candidate Joe Salazar obliterated the competition with a 28 to 1 vote over Phil Weiser, a Boulder resident who is also seeking the seat. 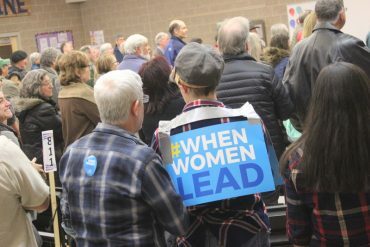 There were no long lines to check-in nor traffic gridlocks outside of Columbine Elementary in Boulder on Tuesday as there were for the 2016 Democratic Party Caucus. Still those who showed up demonstrated enthusiasm for their candidates and their issues. There were 285 pre-registered Democrats to attend caucus at Columbine, and of those assigned to the school cafeteria (about 100) more than a dozen raised their hands when asked if this was their first time to caucus. Of the 235 precincts in Boulder County, 33 “Super-sites” of multiple precincts were located in area churches, schools, and the University of Colorado, Boulder. The site at Columbine Elementary covered an area of North Boulder, and west of 28th Street. The governor’s race was the only race decided in caucus. In precinct 808 where 39 people reported, Cary Kennedy won 24 votes, picking up six delegates that will represent her in the county and state Democratic assemblies. Jared Polis won 13 votes, earning him four delegates. 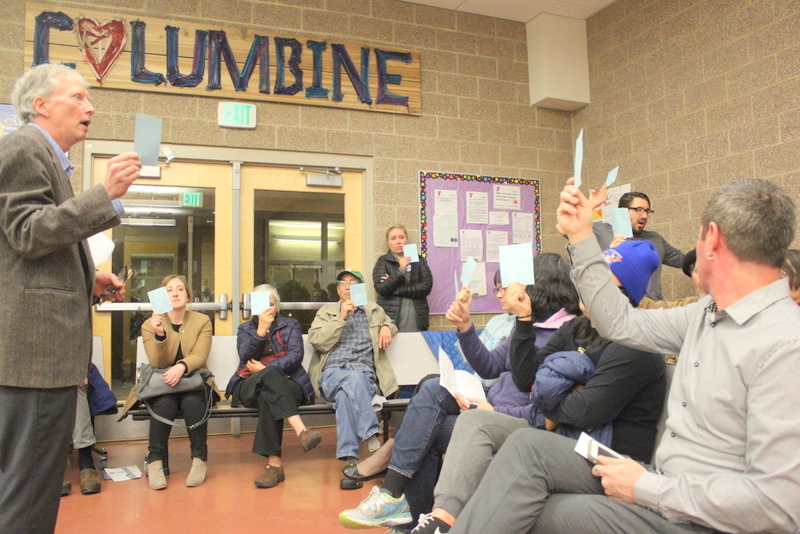 Neither Noel Ginsberg, Mike Johnston, nor Erik Underwood received votes in Precinct 808. 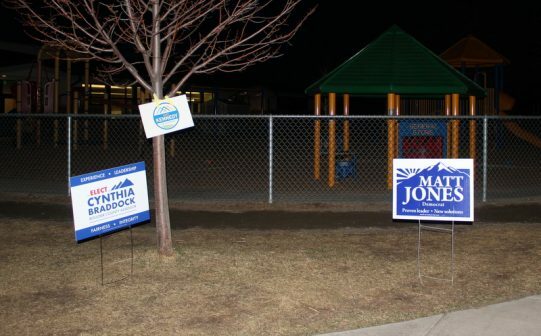 Mike Johnston is reported to have turned in enough petition signatures to win a spot on the primary ballot, and Jared Polis was said to also be close to turning his petition signatures. If the two candidates receive enough verified signatures, they will be able to appear on the primary ballot despite caucus, or assembly results. Prior to the vote, Mayor Pro Tem Aaron Brockett who said he was speaking on his own behalf, presented in support of Jared Polis. He painted Polis as a champion of education, renewable energy, and of the fight against climate change. Brockett made the point that Polis, a current US representative for House District 2, was one of 58 representatives to move forward a measure to impeach President Donald Trump. According to Brockett, civil rights leader Representative John Lewis of Georgia endorsed Polis on Monday. Polis’ platform includes increased funding for public schools, full-day kindergarten, healthcare for all, a living wage, a modern transportation funding system, universal broadband, and 100% renewable energy by 2040. But those who raised doubt about Polis said, “Polis is not a friend to the Democratic Party.” DeAnne Butterfield added, “Just last week [Polis] voted with Republicans to deregulate big banks such as JP Morgan.” Another participant pointed to Polis’ “changing” position on fracking, “This is the biggest risk we face in our community. [Fracking] takes a lot of water. We’re just going to run out of water.” Another who identified herself as Sarah defended Polis after meeting him recently, and said that some in community depend on fracking to make a living. Sally Yerter spent her allotted two minutes of the Plenary Session in support of Cary Kennedy, a former state treasurer, who also holds education as a top priority. Yerter reminded the caucus that Kennedy was an author of Amendment 23 that passed in 2000 regarding funding for public schools. The funding led to the rebuilding of 380 schools across Colorado. Yerter voiced support for Kennedy’s position on making the cost of living more affordable, the fight against climate change, and an affordable public option for healthcare. Kennedy says that she supports and option for Coloradans to purchase coverage through the state’s Medicaid Program, or an employer private plan that she hopes would increase options for especially rural communities. Kennedy is endorsed by the Colorado Education Association. Colorado Senator Matt Jones (photo left) made an appearance to encourage support for his campaign for Boulder County Commissioner. 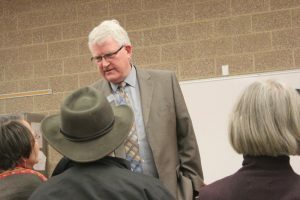 A 14-year veteran in the Colorado legislature, he reminded the caucus of his record fighting fracking, drawing cheers and applause from the caucus. Jones referred to his work getting to 100% clean energy, and his position for Boulder County to receive its fair share of transportation funding, “We need to have a train here before we’re dead.” Jones was referencing the failure of the Regional Transportation District to provide light rail to the northern corridor of the Front Range despite a voter approved tax increase to fund a system in Boulder County. Former Colorado Representative Claire Levy encouraged voters to get behind Joe Neguse who is hoping to win a seat in the US House of Representatives for District 2. Levy highlighted Neguse’s support for national Medicare for all, his work to combat climate change, and his support for eliminating subsidies for the fossil fuel industry. Levy said that Neguse would like to see a $15 minimum wage across the nation, and would like to see higher education more affordable to all. As a co-founder of New Era Colorado, a youth-led voter rights organization, Neguse campaigns on a platform of preserving the right to vote, and gutting the 2010 US Supreme Court Citizen’s United decision. Levy profiled Neguse as a champion of voter rights who would work for an automatic system of voter registration. Angelique Espinosa hopes that Raffi Mercuri will be Boulder’s next Clerk and Recorder for his passion to have voter access to registration easier. According to Espinosa, Mercuri wants to introduce voter education that he hopes would turn out more voters. The platform is similar to that of Molly Fitzpatrick, organizing director for New Era Colorado who also would like to see an improved statewide registration and better administered elections especially of underrepresented groups. As a member of New Era, Fitzpatrick worked with the state legislature to pass a bill that would enable 16 and 17-year olds to register to vote. In a nonbinding straw poll, Mercuri won 11 votes, and Fitzpatrick was supported by 6 voters. 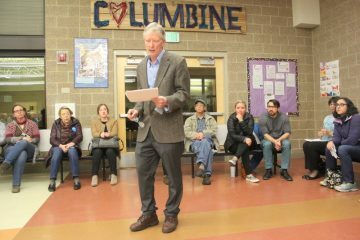 Boulder County’s Democratic Assembly is scheduled for March 24, at Boulder High. The state assembly will be April 14 at the Bank One building in Broomfield, and the state primary election will finish June 26.